For 18 nights this autumn, Howl-O-Scream unleashes a new type of terror. As Busch Gardens Tampa, transforms in to one of Florida’s top-rated Halloween events, complete with 300 acres of fears and frights, including a new horrifying haunted house and sinister surprises around every corner. Howl-O-Scream will run on selected nights between September 26th and November 1st 2014. You’re invited to LEGOLAND Florida to celebrate Halloween for the third annual Brick-or-treat event. This kid-friendly celebration takes place each Saturday in October from 9:30am to 7pm and Sundays from 9:30 to 6pm. There are a whole host of spooky activities featuring trick-or-treating along the brick-or-treat trail, super brick build activities and the largest LEGO Jack-O-Lantern in the world, Halloween entertainment and an all-kids costume contest with brick-tastic prizes. During Brick-or-Treat at LEGOLAND Florida, guests can also experience more than 50 rides, shows and attractions and this event is included in normal park admission. Join SeaWorld Orlando every weekend this October for silly spooky fun at SeaWorld’s Halloween Spooktacular. During the day, children and adults alike will be immersed in an underwater “fantasea” filled with trick-or-treating; dancing with Sea fairies and pumpkin fish and kids can create sea-themed arts and crafts. Included with park admission, guests can enjoy the wonders of the sea at Penelope’s Party Zone, search for hidden “sea” treasures using their Spooktacular maps at fifteen different locations, and stroll among colourful, playful schools of pumpkin fish and other whimsical characters like Penelope Pumpkin fish, Shamu, Dolly Dolphin, Shivers the Polar Bear, Pete and Penny Penguin and more! SeaWorld’s Halloween Spooktacular takes place 12-8pm during weekends in October and is included with park admission. Every year Walt Disney World’s Magic Kingdom Park plays host to the ultimate trick-or-treat neighbourhood as Mickey’s Not-So-Scary Halloween Party returns on select nights from September 1st – October 31st 2014. All guests are invited to dress up in their favourite Halloween costumes for trick-or-treating, meet and greets with Disney characters donning Halloween costumes and unique Mickey’s Not-So-Scary Halloween Party. Every night you can also look forward to “Mickey’s Boo-To-You Halloween Parade” lead by the infamous Headless Horseman, followed by “HalloWishes,” a green and orange fireworks display complete with Disney Villains. Admission to this event is ticketed and all guests wanting to attend will need to purchase additional tickets from Walt Disney World Resort directly. Your worst nightmares will begin to take shape as Universal Studios Florida theme park is transformed into the award winning Halloween Horror Nights for the 24th year in a row! 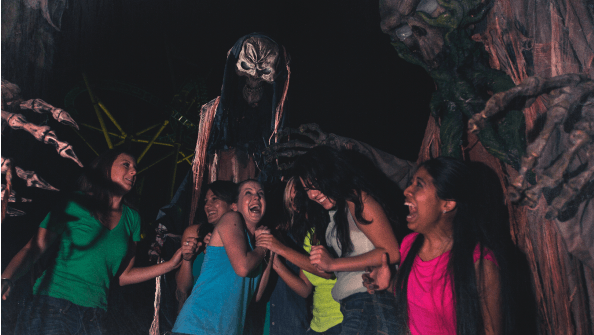 Step into some of the most pulse-pounding moments in horror history on select nights from September 19th – November 1st 2014. You will be able to explore eight tarrying haunted houses, make your way through multiple street experiences where creatures lurk around every turn, enjoy outrageous live shows and experience many of the park’s most exciting rides and attractions. For more information about booking your Florida park tickets visit Orlando Ticket Deals to see our great range of prices for all the top Orlando theme parks and attractions, including Walt Disney World, Universal Orlando, SeaWorld Parks and loads of other Orlando experiences.